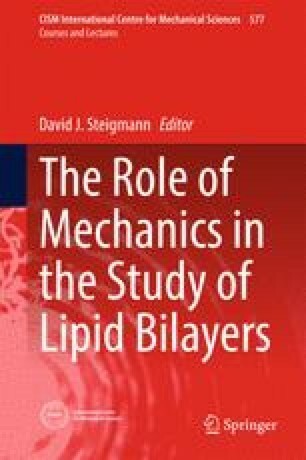 This chapter discusses the computational modeling of lipid bilayers based on the nonlinear theory of thin shells. Several computational challenges are identified and various theoretical and computational ingredients are proposed in order to counter them. In particular, \(C^1\)-continuous, NURBS-based, LBB-conforming surface finite element discretizations are discussed. The constitutive behavior of the bilayer is based on in-plane viscosity and (near) area-incompressibility combined with the Helfrich bending model. Various shear stabilization techniques are proposed for quasi-static computations. All ingredients are formulated in the curvilinear coordinate system characterizing general surface parameterizations. The consistent linearization of the formulation is presented, and several numerical examples are shown. The author is grateful to the German Research Foundation (DFG) for supporting this research under grants GSC 111 and SA1822/5-1. The author also wishes to thank Kranthi Mandadapu, Thang Duong, and Amaresh Sahu for their valuable comments, and Yannick Omar for his help with the example in Sect. 13.3. Special thanks also go to David Steigmann for organizing the CISM summer school that led to this article.